The goal is to help doctors make better predictions about how a patient’s illness will progress and what type of treatment will be most effective. The project, supported by a new $3.75 million National Cancer Institute grant, was launched because researchers now realize that cancer cells affecting the same type of tissue can behave differently in different patients. Prostate cancers may grow rapidly in one patient, but expand at a glacial pace in another. A drug that kills a tumor in one patient may be useless or even harmful in the next patient. To help doctors prepare a more personalized medical prognosis and treatment plan, Johns Hopkins has assembled experts in cancer and engineering, led by Denis Wirtz, associate director of the university’s Institute for NanoBioTechnology. The team has begun characterizing and storing cancer data collected through a process called high-throughput cell phenotyping. 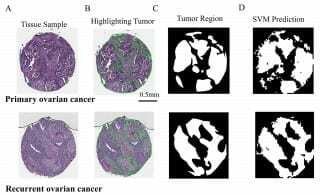 “We use scanning microscopy to take pictures of the size and shape of cancer cells,” said Wirtz, who also directs the Johns Hopkins Physical Sciences-Oncology Center. “We also extract information about what is happening inside the cells and at the genetic level. We make notes of the age and gender of the patient and any treatment received. Looked at as a whole, this information can help us identify a ‘signature’ for a certain type of cancer. Wirtz, a professor of chemical and biomolecular engineering in the university’s Whiting School of Engineering, has been working with School of Medicine researchers Ralph Hruban and Anirban Maitra to begin the database with material from the files of thousands of cancer patients who have been evaluated and treated at Johns Hopkins. The patients’ personal information has been deleted, but the remaining medical case data allows the researchers to trace the course of the disease from initial testing through treatment and outcome.